April 11, 2019 Robert W.
Las Vegas For Lease Real Estate Signs allow your property you want leased to get noticed by people passing by. People in the real estate industry have written about the effects of signage on sales and leases and the rule of thumb is that a real estate sign will result in 10% of the time in a sale or lease. 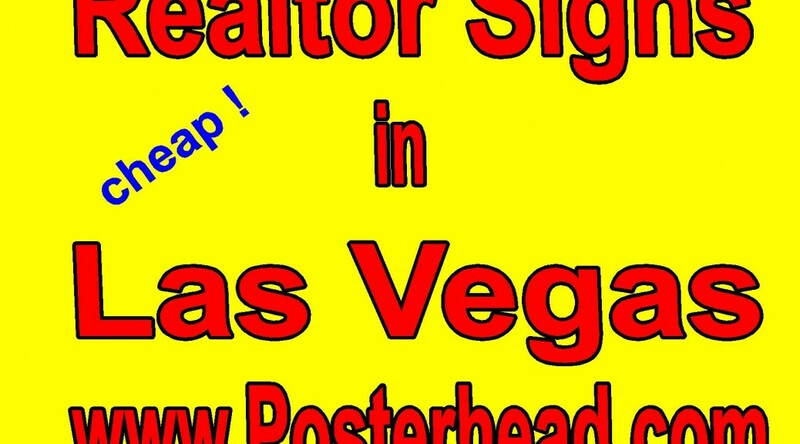 Las Vegas for lease real estate signs work ! Property has been in a boom cycle in Las Vegas for many years now. Not only has the United States economy picked up, many Californians are leaving the Golden State to come to Nevada because of its affordability, low crime and opportunity. Consequently, many homes and buildings have been built to accommodate the increased population. Las Vegas for lease real estate signs have sprung up all over the valley in order to lease and rent these properties out. These for lease realtor signs are generally larger than the 18″ x 24″ standard real estate sign and come in a 4ft x 4ft size or 4ft x 8ft size. Information about the property for lease is placed on the sign along with contact information for the broker and agent who is listing the property for lease. In many cases, specific information about the properties size, utilities, zoning, etc. is placed on the sign to help determine if the property is right for the lessee. The signs are then placed in a location on the property that is most advantageous to be seen be people driving or walking by. Las Vegas for lease real estate signs can be designed and made in Las Vegas by local sign stores. These signs can be any color you like and include pictures and logos as well. These real estate will be made with aluminum or wood depending upon your signage needs. January 19, 2019 Robert W.
Large for lease signs in Vegas can be seen in front of commercial properties that are being leased out. Large for lease signs help identify buildings or properties that are for rent / for lease and usually list information about the property to help clients understand what is being offered. Large for lease signs are not expensive and considered a cheap form of getting your property advertised. With one out of ten properties sold with a listing sign, its a sure fire bet that a for lease / for rent sign has similar statistics of success. Large for lease signs can be made out of aluminum or wood substrate. While older realtors prefer the heavy wood signs, many newer realtors prefer the cheaper aluminum signs because of the look. Also, the aluminum signs are cheaper than the old traditional wood signs. The aluminum signs will not rust or weather like the wood signs. The aluminum 4ft x 4ft signs sell for under one hundred dollars and the 4ft x 8ft aluminum signs sell for less than two hundred dollars. The heavier wood MDO 1/2″ signs sell for around $125.00 for a 4ft x 4ft sign and around $225.00 for a 4ft x 8ft sign. February 25, 2018 Robert W.
Commercial realtor for lease signs are used to display a property that is being leased out in the Las Vegas area. Usually these signs are for large commercial properties and are placed at the front of the property so that traffic can see them as they drive by. Many times the sign will contain information about the property, not just the realtors contact information. Commercial realtor for lease signs are made out of MDO board or aluminum. Full color vinyl sticker prints are applied to the MDO boards or aluminum and are usually topped of with a laminate so to make the sign last longer. In addition, the laminate makes the sign able to be wiped off and simple graffiti can be eliminated. ( Of course, they make a graffiti laminate especially designed to be able to be wiped off if someone does graffiti on your sign ) The MDO boards are more expensive because of the cost of the material and are much heavier than the aluminum. However, the aluminum is much lighter and easier to install and many realtors like to put up their own for lease signs. In addition, because it is aluminum, it wears very well in the different seasons that Las Vegas has to offer. The vinyl prints applied to the MDO or aluminum can be full color and include your picture and company logos. Commercial realtor for lease signs are available at many of the sign shops located in the Las Vegas valley. While not all sign shops have the equipment necessary to make large signs, sign companies like www.Posterhead.com has the ability to print, apply and manufacture your large real estate signs at a low cost. Contact Posterhead or one of the other sign companies to see how these realtor signs can help your real estate firm. November 29, 2017 Robert W.
Las Vegas big for lease banner signs are needed for large buildings or buildings that are away from the street. In these cases, large banners are needed so that they can be seen from further away than normal. These banners can be any color or size. Many sign companies like www.Posterhead.com or www.LasVegasLargeBanners.com can get them made for you very quickly and at a cheap, inexpensive price. Las Vegas big for lease banner signs are printed on a 13 ounce vinyl banner material with eco solvent inks or latex inks. Eco solvent inks are printing inks designed for outdoor and indoor use that hold up very well in the hot Las Vegas summer months without fading. The vinyl banners are then hemmed for perimeter reinforcement and then grommets are placed on the banners across the top and bottom at spacing of around 2ft apart. This allows for secure attachment to your surface. Las Vegas big banner signs can be many different sizes. Many common sizes include 5ft x 10ft , 4ft x 8ft and of course, you can have them printed 10ft x 50 ft. if you choose to. The whole idea is to make them visible for the people passing by. Many buildings are rented or leased by people who just have to be passing by and take notice of your sign. That is why realtors place for sale signs at properties for sale so that they can take advantage of the passing traffic. Busy streets in Las Vegas have traffic counts of well over 5,000 cars per day and more. That is a lot of people taking notice of your signage. Las Vegas big for lease banner signs can be purchased for around $2.00 a square foot or less in Las Vegas. The designing on the banners is easy and usually requires no additional fees.